We will not stop adding tunes to our list until we are out of Steely Dan material. 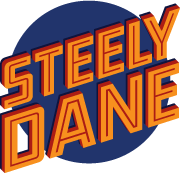 Steely Dane is committed to bringing you the songbook of Steely Dan and Donald Fagen. To that end we try to add two or three new songs to our list for each run of shows. Here’s our full list so far. If you don’t see your favorite, you can suggest it to us below. Don’t see your favorite Steely Dan or Donald Fagen song? Hey, we wanna help! Pop the title in here and we’ll put it in the hopper!